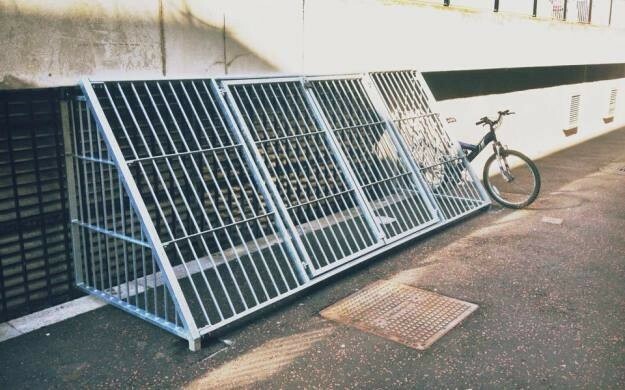 Has Cardiff University built ‘anti-homeless’ cages? Earlier this week, Cardiff University student and blogger Lewis Hopkins first spotted cages installed around warm air vents on his campus, leading to claims that the university is trying to stop homeless people from sleeping near the warmth emitted by the building. Hopkins said that his university is treating the homeless like "animals". A spokesperson told us that "any suggestion that Cardiff University erected the safety grilles to deter homeless people is wholly inaccurate and completely misleading". They continued: "The decision to erect grilles was taken in the interests of health and safety. The area covered by the safety grilles are not hot air vents but boiler flue vents that can potentially produce products of combustion – diluted amounts of carbon monoxide being one of these – as part of the diluted boiler flue gases." Hopkins isn't so sure. "I'm not sure I completely buy the story being spun by the university's marketing department," he said. "I do understand that if the chemicals being produced by the vents are hazardous then action needs to be taken. But why are the university only taking action now? Also, if carbon monoxide is being produced by these vents then surely students using this walkway on a daily basis are at risk too." One Cardiff student commented on Hopkins' blog: "Surely sleeping in freezing cold and soaking wet conditions during the winter will cause more harm than the steam from the vent ever could. We should be helping these people in any way possible, not taking away their only source of warmth because it makes the university campus look bad." The cages have unfortunate echoes of the spikes installed by Tesco outside its Regent Street branch in London. 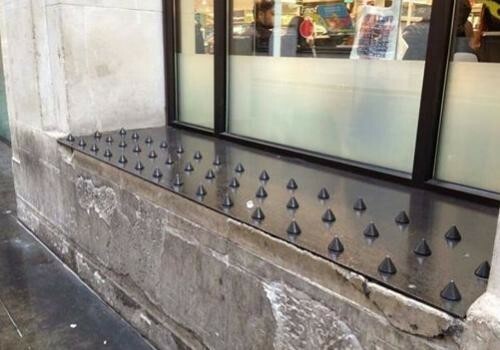 Like the university, Tesco denied that the spikes were anything to do with deterring homeless people, claiming that they'd been put in place to stop "anti-social behaviour". Anti-homeless spikes also appeared in the doorway of luxury flats near London Bridge (because residents were clearly bored of stepping over other human beings when they collected their Ocado delivery). Both Tesco and the London Bridge property developers later agreed to remove the spikes after a fierce backlash. Hopkins described the installation of the cages at Cardiff University as "mean-spirited" and believes that vastly different steps should have been taken to address the problem if chemical contamination was at fault. "The cage looks ugly, perhaps a sign would have had the same effect if these chemicals are so hazardous," he said. "A flume or a chimney taking the chemicals far away from public contact would have perhaps been more effective. The cage was a terrible PR move on the university’s behalf." The number of rough sleepers in the UK has risen year on year. According to the homeless charity Thames Reach, "the autumn 2013 total of rough sleeping counts and estimates indicates a total of 2,414 people. This is up by 5% from the autumn 2012 total of 2,309 and 37% from 1,768 in 2010". Coincidentally, today is World Homeless Day, a global event that seeks to "draw attention to homeless people’s needs locally and provide opportunities for the community to get involved in responding to homelessness." Guess Cardiff didn't get the memo. The Welsh homeless charity Solas Cymru is very disappointed with the installation of the cages. Speaking to Dazed, the charity said: "It is really disappointing that the university has taken this action. This is not the way to solve the problem. The university has a responsibility to play its part in social justice and work with the Local Authority and homelessness organisations to identify solutions."